With creative processes and innovative products, Domtar continues to lead developments in biomaterials science, using the distinct properties of trees to offer renewable alternatives to fossil fuel–based products. One natural paper-making byproduct that has tremendous potential is lignin. Lignin is the natural glue that holds wood fibers together. It’s also a byproduct of the kraft pulping process. For years, our mills have used lignin to produce energy for our operations. But it also can be used in a wide range of industrial applications as a sustainable and biodegradable alternative to petroleum and other fossil fuels. Five years ago, after a lengthy research and engineering project, Domtar opened a commercial-scale lignin separation plant at its Plymouth, North Carolina, mill. The plant, which is the first of its kind in the United States in more than 25 years, improves the mill’s pulp-making efficiency and produces BioChoice™ lignin, which can be used in a variety of applications, including adhesives, carbon products, coatings, dispersants, fuel additives, natural binders and more. 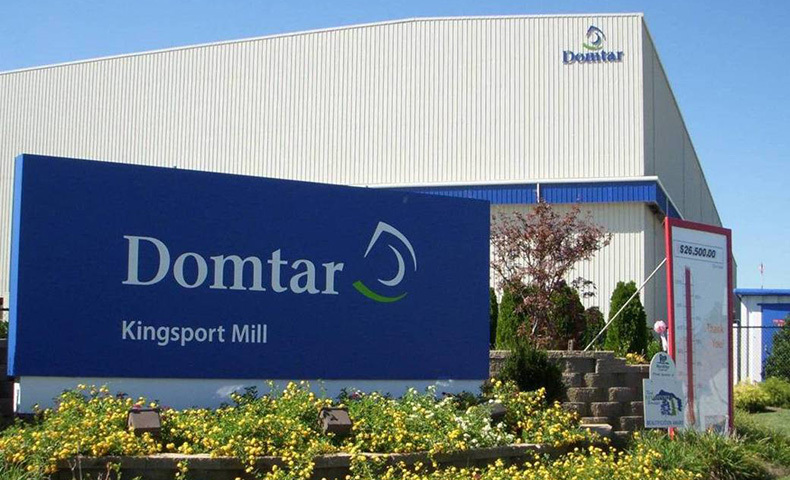 Following up on that project’s success, Domtar is exploring even more opportunities for BioChoice lignin at its Kingsport Mill in east Tennessee. Unlike at Plymouth Mill, which produces softwood kraft lignin, the trials being conducted at Kingsport use hardwood and a sulfur-free pulping process. This type of wood and pulping process yields lignin with distinct qualities, including less odor. Dale Mitchell, director of business development for Domtar, says researchers and customers are currently studying the samples being produced at Kingsport. The ongoing work at the Plymouth Mill and the testing at the Kingsport Mill are just two examples of our research and development in biomaterials. With existing and emerging technology, almost any petroleum-based product can be replaced with a bio-based alternative, sometimes with better performance and at less cost. By developing innovative ways to use trees, our experts in biomaterials science are writing the next chapter of the company’s growth and creating renewed demand for healthy, viable forests. Our focus on biomaterials science is just another example of Domtar’s approach to sustainability: working smart for the long term. To learn more about sustainability at Domtar, read our 2017 Sustainability Report. You can also watch our animated video about biomaterials science.